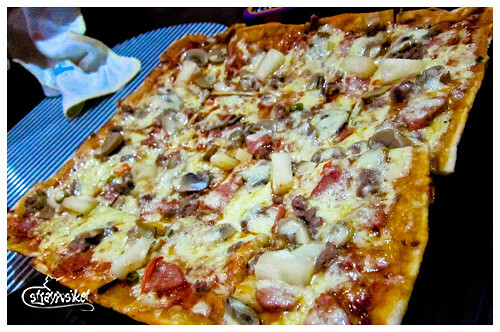 Almost everybody from the travel forums who's been to Bantayan is raving about this pizza. And since we were already there, we thought we should try it ourselves. 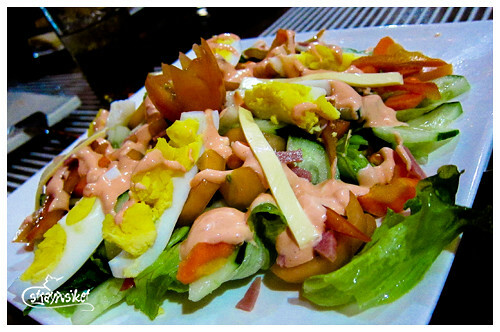 Hence, the dinner at Tristan’s Bar and Restaurant. We were supposed to walk all the way to Tristan's but we were told that i'ts a bit far so we decided to take the pedicab and they were only charging 5 pesos per head. Cheap no? So go na go! 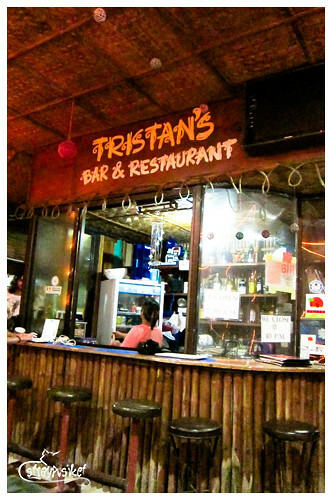 Tristan’s is actually a small resort with a simple open-air restaurant fronting the beach. There were no customers when we arrived so we were immediately attended to by the staff. Of course we ordered their best selling pizza — three 16-slices — and bottomless iced tea for the group. 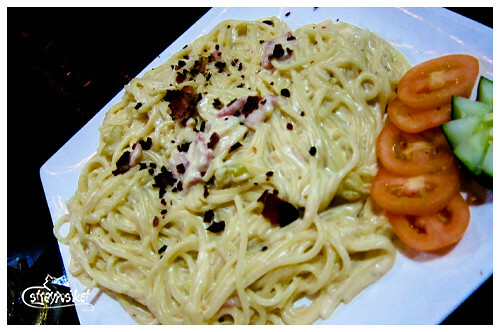 Some of us ordered sides – Carbonara, Spaghetti with Meat Sauce, Caesar Salad and Thousand Island Salad. It only took a few minutes for our orders to be served. Tristan's Pizza. Thin Crust. Cheesy. Hot! Kaya pala non-stop ang refill ng iced tea. Tastes good but not to die for. 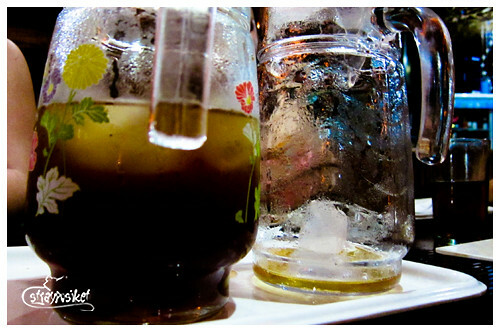 And yes they were very generous with their iced tea. They kept on refilling the pitchers. Teka lang namaaan. Meat Sauce Spaghetti –more like a ketchup Spaghetti. Hindi namin type. 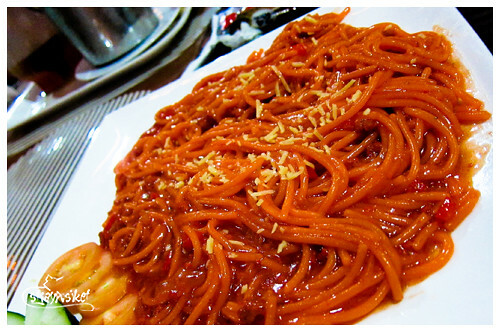 =( It reminded us of our canteen spaghetti way back in Highschool. Their good for 2 servings are actually good for 3-4. Generous talaga. The pasta also came with toasted bread. All in all, the experience was great considering their cheap price. 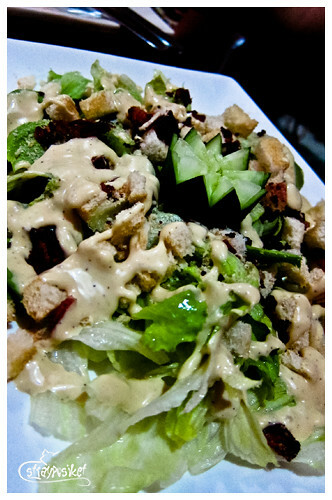 Aside from their generous servings, the owner and her staff were very accommodating. All the food we ordered are delicious except for the spaghetti. Even the kiddo didn't like it. 5 pesos na fare? meron pa palang ganun ngayon..
looks yummy yung mga food. how much is the pizza? i should try that too when I hit Bantayan. thanks for sharing! 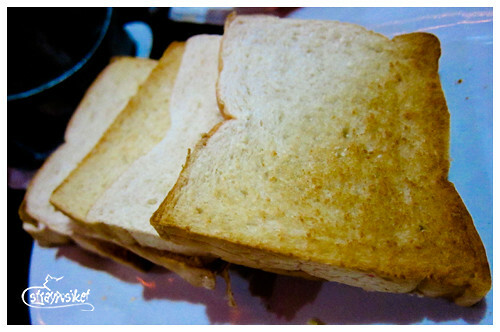 @thepinaysolobackpacker it's around 350-380 (can't remember) for 16 slices. yung pasta 180. I really like the pizza which my momma make it at home.The taste of this pizza is really very yummy. Sometimes I like just cheese. Sometimes I like onions, mushrooms, bell peppers, etc veggies. I always tell here to make it once in a week.The above pictures of pizza are really good.